Up till now we did it not so very good. I played this scenario already several times and normally there comes always an interesting transport service. Of course, we can continue with the passenger's services, but this takes a long time before the earnings really increases. The good point is that now the villages are growing by their own, they don't need to be stimulated by bus transport. For example our Head Quarter village, Dinsoft. It has are now already 310 inhabitants and 25 passengers per month. There are still new buildings under construction. Very soon we can borrow a $100,000 more. 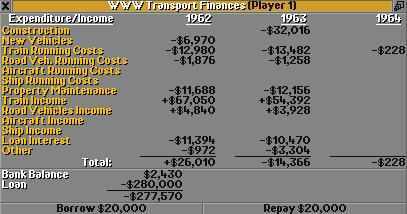 With this money we can setup a train service between Dinsoft and Lendhead. The railway station in Lendhead is already prepared for two trains. We have to build a station in Dinsoft and to construct the railroad. To get a bit more money we sell the bus, which ran the same service. On February 26 bus 2 was sold for $3,316. It gives some more money for the train. We use the same cheap locomotive as for the other train, one passengers can and a mail van. The income graph show an up going line. The competition is still trying to make a railroad between the gold mine in Slindwood and the bank in Drontburg. May 12 a new forest in the mountain near Ledinghattan. July 1 is an historical date. Enough money was earned to pay off $20,000 of the loan. It means that there is now $80,000 available for new investments. The best we can do is to setup a new transport service, that's our job, isn't it? OK, after looking around on the map, a good place was found. First I looked to Tatfield, which is already quite big, but then a new company started to operate there. It's better to look at another place. Here it is, Tindhall with 637 inhabitants. The Railroad Station has a connection to the neighbor village Carfingley, 177 inhabitants. Our loan is now the maximum of $300,000 and there is only $9,500 cash left. It will be an exiting time in the future. The year 1961 ended negative. But the train earnings were around $50,000 If we don't invest any more money, then the earnings for this year will be good. The cash increased already to $11,040, so there seems to be some progress. At the end of January we bought a second passenger car for the Tindhall train, always too many passengers left on the station. June 22the first money repaid after the new loan, $20,000 on the bank for new investments. We have to look to the bus, remember, there is only one left. It's already 10 years and within two years more it becomes old and the reliability decreases a lot. Then it is time to replace it. A new bus is about $25,000 (1962). No money to spend, so these messages are always given some frustrations. The time goes fast. the earnings for 1962 were $26,010, the company's all time high. On January 19, we brought another $20,000 back to the bank. In April we received the long expected message, about our bus, it is getting old. We have no money to buy a new one. 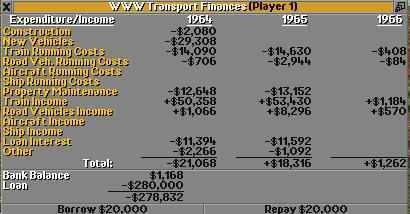 The company League Table shows that WWW Transport is not (yet) at the top. The number one is Green Transport. They have a gold transport line. In the mean time our old bus had a collision with an UFO. I'm really sorry that there is no picture from this accident. These UFO collisions are frustrating things with busses. We are just lucky that it is an old bus. Once an UFO comes, you can not stop it. It's maybe better now to set up a train service to replace the bus. Here on the right you can see the effect of a collision between a bus and a UFO. Since busses are not so good, we go to replace the disappeared bus by a train. First a picture from Slindwood with the to be changed bus station. At the right side you can just see a part of the gold mine. The train station and the railroad are ready but now there is only about $20,000 left. Too less to buy a train, we have to wait. We made a two-platform station. With the other rail maybe a gold transport can be setup. To avoid building houses, a few rails are placed. 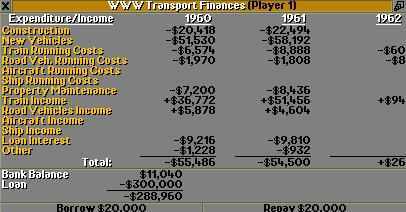 The earnings in 1963 are about a $10,000 less then last year. We received our first subsidy offer. It is for the gold service from the Profingly Gold mine to the already well known bank in Drontburg. WWW transport is now on the first place. Our level is still "Traffic Manager"
Only waiting is not so good, we must stimulate the transport. In October we get an offer to test a new bus. This bus goes faster and can carry more passengers then the old busses. We bought one new bus for $30,384 and put it on the line form Kendhattan to Slindwood. In fact this line is still waiting for a train, but we have no money for it. Now the new bus replaces the old destroyed one. Hopefully will this new one last for a few years. Our service rating for passengers in Slindwood was about 5%, now it goes quickly up to 25%. Normal values are 50 to 80 percent. As you can see, there is a lot of gold waiting for transport. We have not enough money to setup a gold transport service. In 1964 we bought a new bus for $ 29,308. Further there were some construction costs. All earnings are about $51k. Bank account has only $1,542. This means that in 1965we can not do anything, but watching our mini world. It is also not my favorite model, it's expensive and slow. It's August 1965. 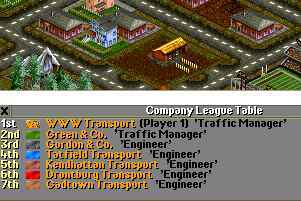 In the Company League table we moved down to "Engineer and we are now on the second place after "Green transport", the company with the gold transport. We still wait until we earn enough money for a train between Slindwood and Kendhattan. If we don't spend any money this new year, then somewhere half way we can buy our new train. Our biggest competitor is lucke today, there gold mine increases the production. The very short after the previous one, there is another message, but now about a decrease of the produntion of a gold mine. As you can see, nothing was done last year. We did only drink some coffee and watched the game. It is very important to look always to the bus(ses) and to save the game regularly. If a bus is destroyed by a UFO, then we close the game and take the previous savegame. Sometimes we can avoid the collision with the UFO, but in most cases we have to sell the bus before the collision. In March a new locomotive is announced. This is one of my favorite types. It is not so very expensive and it can go a lot faster then the already existing ones. Begin of May it is so far. We earned enough to replace the bus by a train. First we sell the bus, gives us about $22k. Then we can buy (again) the smallest locomotive ($56k) with one passengers car. End of May our money increased already so much that we could ad a Mail Van to the train. On the picture you see the new train, the cheapest and slowest locomotive, with one passengers car and one Mail Van. 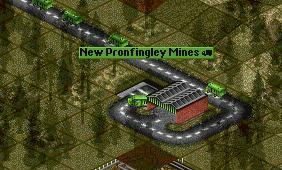 Our strongest competitor, Green Transport started a new gold service form the New Profingly Gold Mine to the bank in Drontburg. They uses armored cars. These cars will take a very long time before they arrive. at the bank. Let's watch them to see if they really arrive there and what money they earn. After a long time the first car arrived at the truck station near the bank The brute earnings are $1,888, the net earning we can see in the information window of the vehicle is $1,366. In fact we have to look to this amount when the vehicle is back at the gold mine. The year 1967 brought some stabilization in our company, the earnings seems to go upward now. We bought a new train and even our earnings are positive. Also now we can borrow again $100,000 more, the maximum loan is now $400,000. The transport ratings on the railway station of our Head Quarter village are not so very good, 35% for both passengers and mail. Also the village grows a lot. It would be good to start a train service to the neighbor village "Chanville" at the other side of the river. The train has again the cheapest locomotive with one passengers car and a mail van. In Dinsoft we demolished the simple station and replaced it by a two-platform one. 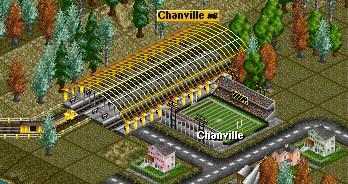 in Chanville we built also a two-platform station. The train runs, $34,495 left. After some time watching the trains suddenly was found that in Lendhead on the railway station are a few hundred passengers waiting. 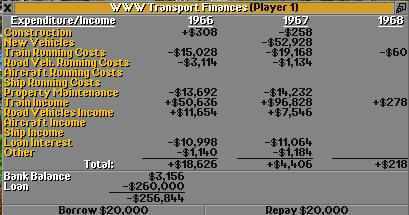 This is really bad, with a few more passenger cars we can earn much more money. Business is booming, we earn more and more money. Some money was left over to improve our Head Quarter. Look at the picture, doesn't it become a nice building? You can compare it with the picture at the top of this page, taken in 1960. Half December we have enough money to setup another train service. We go to make a railroad between Overingway and Chanville. Overingway is quite a large village with good transport opportunities. We make there a two-platform railroad station, then there is one rail free to connect later to a new station in Lendhead. In the previous year our train income was already more than $180,000. At the end it's negative, this because everything was invested in new railroads, stations and trains. Our load at the bank is still at it's maximum, $400,000 This does not matter, as long as we earn enough to pay the loan interest. Also the train from Chanville to Overingway is in operation. After this line was established, only a little cash was left. But we have now six trains and they all make money. We have only to wait only a short time to see our bank account increasing. Train 1 is already 13 years old. It has quite a long line. The best is now to replace the locomotive by a new and faster model. My favorite locomotive can reach 112 km/h and cost only $121.000. This locomotive is a very good choice for a flat railroad, it's engine is not strong enough to go fast in the mountains. It looks that we did it quite well in this decenium. 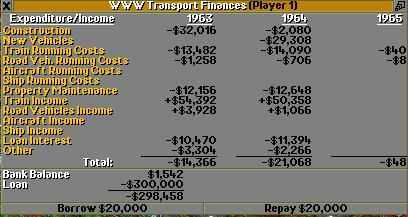 In the beginning it was really a bit hard, but now the WWW Transport Company owns already 6 trains. All trains are making money. Our next goal is to replace the train 2 from Lendhead to Dinsoft by a new fast one and the we go to make the next step; expansion, try to grow the company. as much as possible.